Many pastel artists buy conventional H style easels that have nice features also for pastel work. Some of you may also buy a Taboret or have a table or cabinet to put your pastels near the easel. 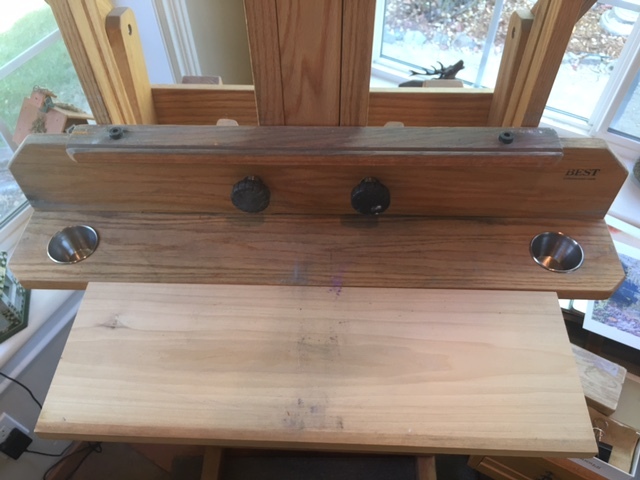 If you purchased an H style easel made by Best or one very similar in design, there is a way to modify it that certainly has been a great help to me. Perhaps some of you may like my solution and so I would like to share it in case you want to adapt your easel in a similar fashion. The adjacent photo is a University Oak Best easel, I purchased one like this for my studio. I like it because it tilts forward and that way pastel dust will not go down the face of the painting. Most easels of this style have a shelf that is approximately 4 ½ inches wide X ¾” thick and the width of the easel. I purchased two 8” long by 1 ½” wide steel flat bars that were pre-drilled and countersunk at Home Depot. I also bought a 7 ½” wide X 2’ long X ¾” thick piece of Alder board as my shelf addition. 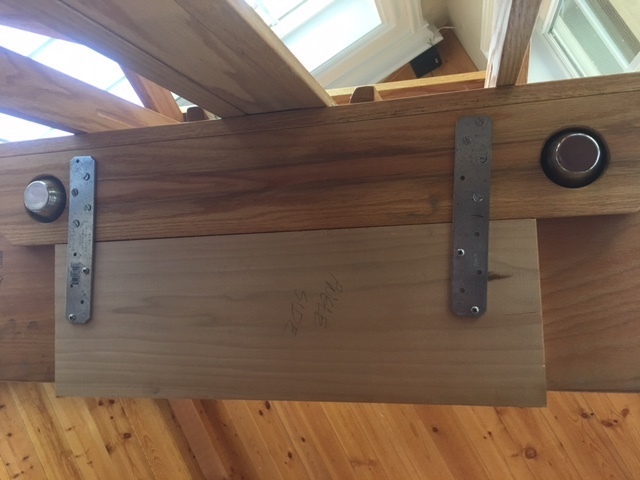 First I marked where the holes would need to be drilled on the underside of the easels existing shelf and pre-drilled them with a 1/8 drill bit since it is hard oak. Then I mounted the bars with four flat head screws that were # by ¾ screws. Since the bars are 1/8” or so thick, the ¾” screws will not go all the way through the shelf. Then I predrilled the Alder shelf after centering it and mounted it with ¾” screws. Top View of added Alder shelf. Once the shelf is in place and screwed in securely, you may place your Dakota pastel box or whatever style or make of box you have onto your new shelf. Now you are ready to go!